In my last post I mentioned that I was reading a fascinating book called the Three Pillars of Zen by Philip Kapleau. I mentioned the practice of zazen which is arguably a very prescriptive form of meditation. As my reading has progressed the author is covering lectures given by his master Yasuntani-roshi starting with 1 Theory and Practice of Zazen. It should be noted that even the Buddha Shakyamuni devoted himself exclusively to zazen for six years before attaining enlightenment. Now he was the Buddha so for the rest of us your time may vary, and yes for most of us could be considerably longer. However with that said there is no average time frame and one should not feel any sense of urgency as the journey is as important as the goal. 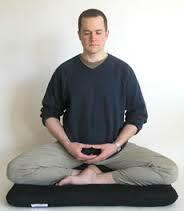 Work on creating a base when sitting full lotus (see picture), half lotus, or quarter lotus sitting positions are preferred. However there are other sitting positions that will provide a good base such as the Burmese posture (see picture below) or traditional Japanese knelling posture (see picture below). Notice the back must be erect and straight, the eyes open, and the hands will typically be held with the right hand underneath the thumbs touching. 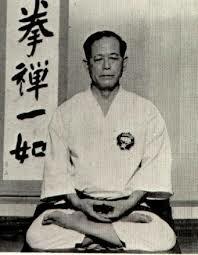 Yasuntani-roshi recommends sitting no more than 30 – 40 minutes at a time, otherwise the mind will lose its sharpness. Beginners should start with 5 – 10 minutes until they become comfortable. I started out with about 10 minutes, and now can sit for 20 minutes or so after several weeks of gradually adding time. It was not something I did in any systematic fashion, instead it just naturally became easier to sit for longer periods of time as the frequency of sitting increased. The more you sit and meditate the more you look forward to it, and the easier it becomes to sit for longer periods of time. As zazen is the key element to Zen Buddhism it is very exacting. It is worth studying to make sure you are approaching it correctly.